This recipe is from the April 2010 issue of Fitness Magazine (yes, I saved it and just now got around to making it). Preheat oven to 450*. Heat olive oil in large ovenproof skillet over medium-high heat. Sprinkle chicken with salt and pepper; add to pan, meaty side down. Cook for 5 minutes. Turn and cook 2 minutes more. Pour out any excess fat. Return pan to burner, stir in broth and wine, scraping up any brown bits. Scatter garlic, thyme, and olives on chicken. Lay one lemon round on each piece of chicken. Place skillet in oven (I don't have an oven proof skillet, so I transferred to a casserole dish). Roast for 17-20 minutes, or until juices run clear. This chicken is fantastic! Tender and juicy, and so much flavor. I'll certainly be making it again. My guys would love the olives! This looks awesome, I LOVE kalamata olives and most recipes that include them. This looks yummy! I am going to try it! love the tastes of mediterranean! This looks delicious. I've not tried it with cooked with olives before, and DH loves olives. The chicken sounds really good. I do the same thing,... save recipes in magazines. Sometimes I end up throwing them out because I never make anything frome the magazine. Yummy in my tummy! ;) Sounds great! You should totally link this up to my Tasty Tuesday linky! Well, lemon and chicken, that's a good solid start! Sounds delicious! We mostly eat chicken, pork and turkey - so it's nice to have plenty of "go to" recipes. This sounds like a good one for my gang. You should see the collection of cooking magazines I have. Eek. Just can't throw them out! i make a very similar dish, my recipe calls for plum tomatoes, no olives and it is amazing. it may be a martha recipe, not sure. Oh yum, yum, yum! Thank you for that recipe! That does sound really good! We love chicken at our house so I might give that one try. Oh now this just sounds so delicious and whats even nicer is that it sounds really easy! Just my kind of recipe!! I'm always looking for new recipes, this sounds good! That does look and sound delicious!!! When did you say supper was going to be on the table? This looks so good and I can smell it in my imagination. I'm hungry going to fix me something for lunch.. Good Job~!~! Girl, this may be my new favorite chicken recipe too!!! This sounds just marvelous. I've to to try it! God bless and enjoy your Thanksgiving sweetie! I could make this for my weekly lunch packing! I love olives and no one else in my house does, so more for me. Have a great Thanksgiving. Looks so good!!! 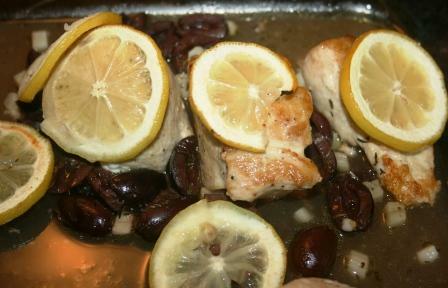 I love recipes with lemon and chicken. Thanks for sharing your delicious recipe my friend. You know I love to it, but sometimes I am just lazy about cooking, but when I read and found sharing like this, I become interested about cooking, oh yeah, it's not impossible that one day I can try this too :) More power to you!